The ESSAYS that Made Lamb's Reputation — 1st U.S. Edition Lamb, Charles. Elia. Essays which have appeared under that signature in the London Magazine. Philadelphia: Carey, Lea, & Carey (pr. by Mifflin & Parry, and J.R.A. Skerrett), 1828. 12mo (I: 18.4 cm, 7.25", II: 16.8cm, 6.6"). 2 vols. I: 292 pp. II: 230 pp. (both vols. without ads.).  First U.S. edition of the official first series, and true first edition of the unofficial second series, of Lamb's pseudonymously published essays for the London Magazine. These eloquently written pieces mingle humor and pathos as they describe the experiences of the author and his acquaintances while attending boarding school, playing whist, listening to music, visiting Quaker meetings, etc. Food is a recurring topic (“A Dissertation upon Roast Pig”); there are two essays on Valentine's Day (one in each volume), and several on plays and actors. The first series made its first appearance in book form in London, 1823. The authorized second series was not published until 1833, under the title The Last Essays of Elia; the pieces selected for the unauthorized American second series offered here are different from those contained in that volume, and mistakenly include three essays written by other hands. A “Bargain” Mason & Webb Mason, Lowell, & George James Webb. The psaltery, a new collection of church music, consisting of psalm and hymn tunes, chants, and anthems.... Boston: Wilkins, Carter, & Co., [1848?]. Oblong 8vo. 352 pp. (lacking title-page & pp. 9/10).  Early edition. “By Lowell Mason and George James Webb, professors in the Boston Academy of Music. Published under the sanction, and with the approbation of the Boston Academy of Music, and the Boston Handel and Hayden Society.” This offers the tutorial “Elements of Vocal Music” as well as the music itself. Illustrated & with Music — NONESUCH Milton, John. The mask of Comus. Bloomsbury: Nonesuch Press, 1937. Folio (39.2 cm, 15.4"). xxiv, 44,  pp. ; 5 col. plts.  Milton's masque in honor of chastity, here accompanied by facsimile versions of the original five songs by Henry Lawes (edited by Hubert J. Foss) and six color-printed illustrations by Mildred R.H. Farrar: a frontispiece, a title-page vignette, and four plates. The Earl of Ellesmere supplied the foreword. The text was printed in Fell types, with the music in Walpergen type, by John Johnson at the University Press of Oxford; the illustrations were printed from the artist's linoleum cuts by the Curwen Press; and the binding was done by the Leighton-Straker Company. This is numbered copy 505 of 950 printed. Provenance: Front pastedown with calligraphic bookplate of Norman J. Sondheim, American collector of fine press books. “A Second Edition of My Mutilated Poems” Neal, John. The battle of Niagara: Second edition — enlarged: With other poems. Baltimore: N.G. Maxwell (pr. by B. Edes), 1819. 18mo (15.6 cm, 6.2"). Add. engr. t.-p., 272 pp.  Second, expanded edition, following the first of the previous year, of the author’s second published book. In addition to the title piece, the volume includes “Goldau: Or the Maniac Harper,” along with a few shorter works. Neal, who went on to become a prominent voice in 19th-century American literature, describes in the preface here his distress over the first edition, which he calls “crowded and disfigured with innumerable errors — chiefly typographical, however; though in some cases, whole lines were left out . . .” Alas, this edition also required an errata leaf. This Songster Represents a Whole CATEGORY of Entertainment Nichols, Emma J. The Original Old Folks, Formerly Father Kemp’s Concert Book, containing the words of the pieces sung by the company, and also the songs of Emma J. Nichols. Boston: Stacy & Richardson, [ca. 1850–80]. 24mo (13 cm; 5"). 32 pp. WorldCat locates only four copies. A FINE Engraved Title-Page & 18 Splendid Plates [Plautius, Caspar]. Nova typis transacta navigatio novi orbis Indiae occidentalis.... [Linz], 1621. Folio (32.6 cm, 12.875"). )(4 (-)(4, blank) A–M4 N4 (-N4, blank); Engr. t.-p.,  ff., 101,  pp. ; 18 plts.  Curiously enough, the dedicatee of this work, Caspar Plautius, is certainly also its author, writing under the pseudonym of Honorius Philoponus. Plautius was abbot of Seitenstetten in Lower Austria, and no doubt wrote as a compliment to a fellow Benedictine: Bernard Buil or Boyl of Montserrat, appointed by the pope vicar general of the Indies, who, with others of the order, accompanied Columbus on his second voyage as missionaries. In the style of a medieval legendary, Nova typis transacta navigatio novi orbis Indiae occidentalis relates first the westward voyage of St. Brendan, then the exploits of the Boyl and his fellow monks, including some description of the customs of the American native peoples they met, with their lands, their agriculture, their feast customs, et al. Boyl’s missionary enterprise failed, and sadly he is now only remembered for his mordant criticism of Columbus. This book bears an ornate, emblematic engraved title-page, with portraits of St. Brendan and Boyl and more, and no fewer than 18 leaf-filling plates by Wolfgang Kilian. These plates, which mix fancy and realism in entirely engaging ways, include a portrait of Columbus, a scene of St. Brendan celebrating mass on the back of a whale, botanical images of the marvelous Peruvian potato, and numerous views of the missionaries’interaction with the natives, some friendly, and some not—the unfriendliest being notably violent and gory. Also, on p. 35–36 is given an example of purported native American music, with both words and notation. This copy is one (probably the first) of two states of this sole edition (with only three leaves in the preliminaries), without the additional foldout plate found in some copies. Ramírez Carrillo, Alonso. Manuscript document, unsigned. On paper, in Spanish. Peñafiel, Spain, 1621. Folio (31 cm; 12.25"). 15 ff.  Detailed here is the last will and testament of the choir master of Popayán, Colombia. Ramírez was an absentee office holder, for he lived in Peñafiel, Spain, indulged in this failure to take up his duties in the New World by the bishop of Popayán—who happened to be his uncle. The choir master’s wealth was considerable and while not itemized as in an estate inventory, it is more than hinted at via the bequests here of real estate (with provenance), of silver and gold chalices and crosses, and of cash in the form of coin. The bequests also give an interesting picture of the size of his family and the ranking of nieces, nephews, etc. Certified, contemporary copy of the original. Ramírez Carrillo, Alonso. Document (“escritura pública de donación”). In Spanish, on paper. Peñafiel, Spain, 24 April 1615. Folio. pp.  Don Alonso Ramírez was the past choir master of Popayán, Colombia, and by this document gives various properties to María de la Puente, widow of Diego Ramírez Carrillo (Don Alonso’s nephew) and Doña Isabel Ramírez Carrillo, Maria’s daughter. The properties include a vineyard (“nueve viñas” that Don Alonso bought from Diego on 9 March 1591; another (“viña a Manzanillo”) that he bought from Juan Arranz, the elder, citizen of Manzanillo, on 7 December 1612; a third vineyard (“viña a Majuelo”) that he purchased from Francisco Santos and his wife (María Muñoz), citizens of Manzanillo, on 20 April 1614; a piece of land in Manzanillo, in the region called “tierras de las Tapias,” sown with two cargas of seed, purchased from Gaspar Decian on 6 January 1586; and a house in the parish of Nuestra Señora de Mediavilla that he purchased on 16 July 1605 from the administrators of the trust that Joratalina Sarmiento established. A contemporaneous certified copy of the original document. Sound Study — “Professional” Provenance Rush, James. The philosophy of the human voice: embracing its physiological history; together with a system of principles by which criticism in the art of elocution may be rendered intelligible, and instruction, definite and comprehensive. To which is added a brief analysis of song and recitative. Philadelphia: Grigg & Elliot, 1833. 8vo (21.7 cm, 8.5 “). [4 (ads)] ff., 432 pp.  Second edition of this seminal study “which at the time was said to be the most advanced medical study of the human voice” (ANB), by Philadelphia physician James Rush (1786–1869). With over 30 diagrams and charts, including myriad musical notations to show the pitch and duration of syllables, the text offers a systematic notation for the description of speech sounds, followed by a detailed treatise on elocution, used for generations to teach oratory, articulation, and speech therapy. “As a medical scientist who was led to explore the entity called 'mind' and as a 'voice scientist' who rigorously studied vocal behavior, James Rush was probably the first investigator to see that mind is inseparable from the physical phenomena of self-expression” (Hale, 234–35). At the time of his death, Rush left an estate of more than one million dollars and his books to The Library Company of Philadelphia, which established the Ridgway Branch in his wife's name. Of historical note, James's father, the noted physician and politician Benjamin Rush, was a signer of the Declaration of Independence, as was James's maternal grandfather, Richard Stockton. Mid-19th-Century Music for the Young Russell, Benjamin A., & Charles Walton Sanders. The robin red breast; a new juvenile singing book. New York: Ivison & Phinney; Chicago: S.C. Griggs & Co.; Buffalo: Phinney & Co.; et al., 1855. Oblong 8vo. 199,  pp. This is the second edition, following the (scarce) first of 1852; the front cover differs from the title-page in giving the publication information as Chicago. Provenance: Front pastedown with several early pencilled inscriptions, including one reading “To Vestilla from W.B. Lear, July 13th 1857.” A folded section from a smaller hymnal is laid in. Salt, Henry. A voyage to Abyssinia, and travels into the interior of that country, executed under the orders of the British government, in the years 1809 and 1810; in which are included, an account of the Portuguese settlements on the east coast of Africa .... Philadelphia: M. Carey; Boston: Wells & Lilly (pr. by Lydia R. Bailey), 1816. 8vo (23.5 cm, 9.25"). 24, 454 pp. ; fold. map., illus.  First U.S. edition and printed by Lydia Bailey, following the London first of 1814. Salt, a British traveller and Egyptologist, first visited Ethiopia in 1805, and returned in 1809 on a diplomatic mission intended to promote ties between the British government and the Emperor of Abyssinia. 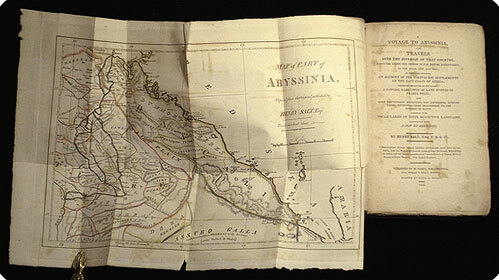 The Voyage gives Salt’s observations of Ethiopian customs, manners, dress, cuisine, and music, along with the factual details of his diplomatic achievements — or lack thereof, in terms of concrete agreements — followed by an appendix comparing vocabulary words from various languages spoken along “the Coast of Africa, from Mosambique to the borders of Egypt, with a few others spoken in the Interior of that Continent” (p. 395). “Guid Auld Highland Whisky, O” The Scotch song-book, containing the following favourite songs... Newcastle & Hull: W. & T. Fordyce, [ca. 1835]. 12mo (15.5 cm, 6.2"). 24 pp.  Lyrics for 20 frolicsome (or occasionally mournful) songs of love, whiskey, and Caledonia, including “Duncan Gray,” “Rub Her o'er wi' Strae,” “A' bodies Like to be Married,” “Gow's Fareweel to Whisky,” “The Birken Tree,” “The Jolly Beggar,” and “The Land o' the Leal.” The wood-engraved title-page vignette shows two men, one on horseback, with a church spire in the background. This little Scottish-themed chapbook is uncommon: WorldCat locates only two U.S. institutional holdings. Ballet Terry, Walter. Ballet guide. Background, listings, credits, and descriptions of more than five hundred of the world's major ballets. New York: Dodd, Mead & Company, 1976. 8vo. Illus.  First edition, second issue. Contains entries for more than 500 ballets. Each entry includes brief synopses and historical background; choreographic, musical, and scenic credits; the names of the companies which produced them, and information on the premiere performance. Also includes a brief history of ballet, a guide on "How to Look at Ballet," and a glossary of ballet terms. With 101 photographs. Overview! (Very Thorough)! Sachs, Curt. Our musical heritage: A short history of music. New York: Prentice Hall, 1948. 8vo.  Later printing. An equal treatment of all musical periods from ancient times to 1948. Collecting some 45+ Years Ago . . . Maggs Bros., booksellers, London. MUSIC: A catalogue of manuscripts & printed books. Part two: Late 18th to end of the 19th century. London: Maggs Bros., 1970. 8vo. 180 pp.  Catalogue 925. 60-plus items and a good index.  Original printed wrappers. Some damage to spine paper.